While Clark is off saving people in Budapest from a flood, Lois confronts a corrupt businessman about some shady dealings. Story - 5: I love how this book starts out with Clark and Lois in the Daily Planet doing what they do best. Lois is out to chase down a story and Clark is off to save people... with a smile on his face I might add. Throughout this story Lois is very "Loisy". She's smart, sassy, and, as I like to say, "on point". This is Lois. The woman every little boy falls in love with when reading a Superman comic for the first time. This is the Lois that is a role model to young girls throughout the world. You really see what I'm talking about when she confronts the shady businessman in his office. Lois goes in and you know right away she is thinking two steps ahead of the guy. He has no chance to win the argument and confrontation that is about to take place. Oh, he'll try, of course. But, we know he is S.O.L. This is a Lois that doesn't need Superman or Clark 95% of the time. When Mr. Bad CEO pulls a gun on Lois after she confronts him about selling Kryptonian Tech on the Dark Net (black market), she doesn't blink or show one ounce of worry. This is a General's daughter. This is a woman that has been around firearms, as she easily disarms him and renders the gun useless. This is a Lois that has seen some "stuff" (keeping it clean, family site and all... ;) ) and isn't going to be frightened by a little thing like a loaded weapon pointed at her head. I won't spoil the story beats like I did on my first review, as it is a really fun story. And, I want everyone to enjoy it if they are reading it based on this review (which judging by the last review's comments, you guys are way ahead of me). I don't know about the rest of you, but when I was reading Lois's dialogue I kept hearing Amy Adams' voice in my head. If this is the Lois we are going to get in Batman v Superman then I am a happy fan. Finally, once again the comic closes out with Lex Luthor. Lex is buying up the company under the guise of a concerned competitor who wants to save the jobs of the company's employees. But, obviously he has his sights set on acquiring the Kryptonian technology for... what exactly? Hmmm... if only there was something coming out that will continue the story next month. Lex is moving the pieces around on his chess board and we will witness his call of checkmate on March 25th. If this is how Jessie is going to play Lex Luthor, then I think we will all be much happier than we were thinking when he was cast. Art - 5: The interior art has such vibrancy. Once again the artwork is simple and sharp. Not too busy and looks gorgeous. When artwork is done well, it really enhances the story, in my opinion, especially for digital comics. Cover Art - 5: Just as with Chapter One, it's the same team involved with this Chapter. So, once again we have a very good cover. 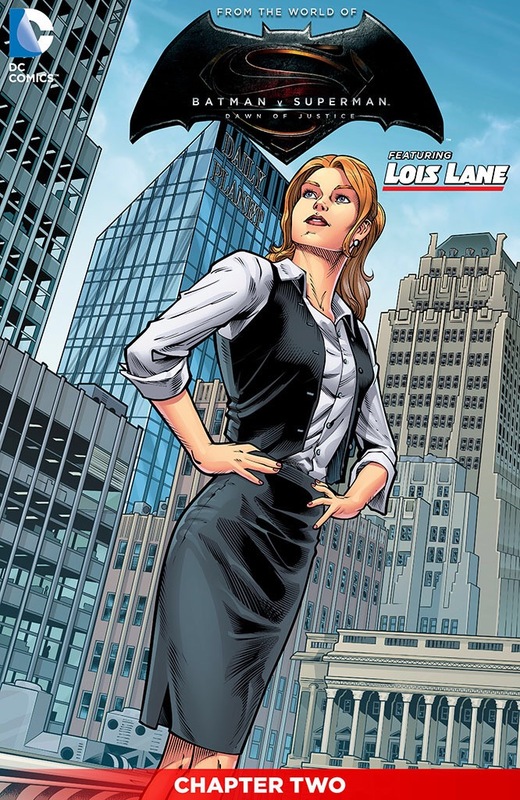 It conveys Lois Lane how you would expect to see her on the cover of a comic book. Meaning, we see her in the classic Lois Lane pose and setting. Right away you pick up on the difference in color. It's brighter, more vibrant. Which is a clear distinction between Metropolis and Gotham (which was more muted in tone).